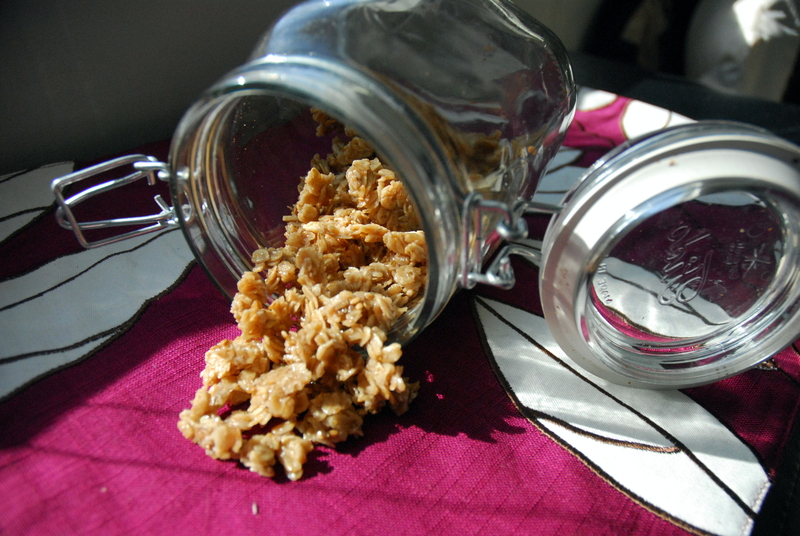 ← The Demise of Grandma’s Cookies? This handsome little man got his haircut yesterday and wanted to show off! 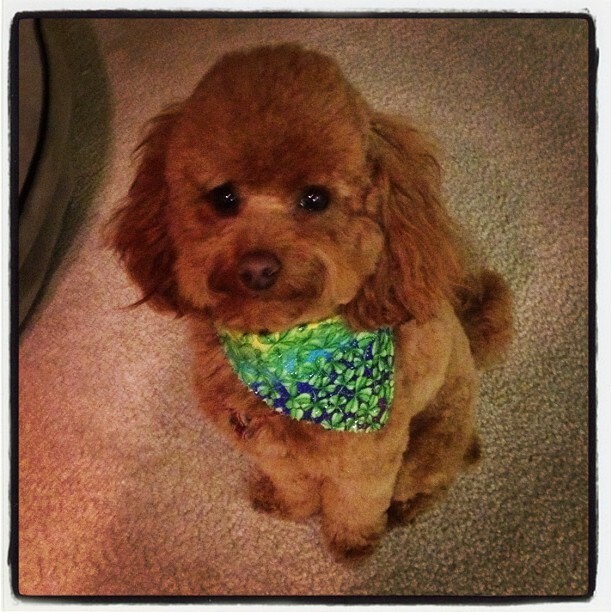 He especially loves his sparkly new St. Patrick’s Day bandana – seeing as he is a ginger and all :). And I wanted to show off my pretty new bowl! Last night we went out for sushi and I had my signature spicy tuna roll, as well as a special roll that Luke forced me to try :). 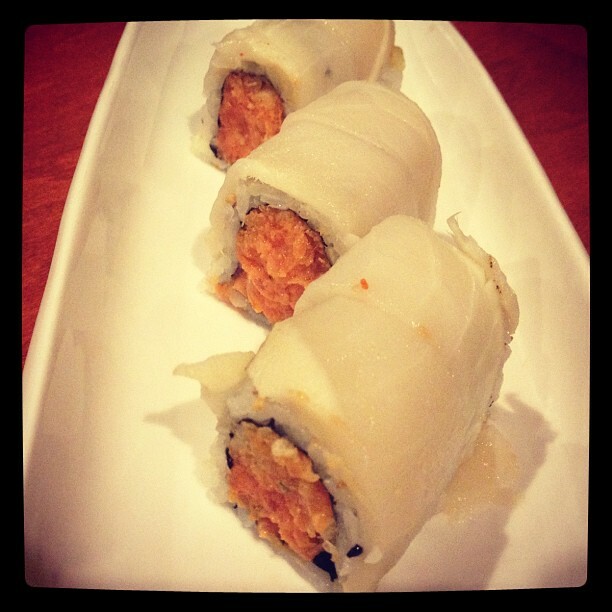 The special roll ended up tasting pretty much the same as a spicy tuna roll, so it was good in my book! It’s hard to get me to try any new sushi. I still can’t even believe I eat sushi. If you asked me 5 years ago, or even 2 years ago, if I would ever eat sushi I would have told you not in a million years. The first time I tried it I held my nose and swallowed :). Eventually, I found a roll I liked (spicy tuna!) and have been sticking with it ever since! After dinner, I decided to refresh our granola supply and try out a new recipe. I’ve never made a fruity granola before, so I had the idea of using jam and honey to create one. My pomegranate granola turned out delicious! The only difference from my normal granola recipes is that this one is a bit chewier – but sometimes I want chewy granola. 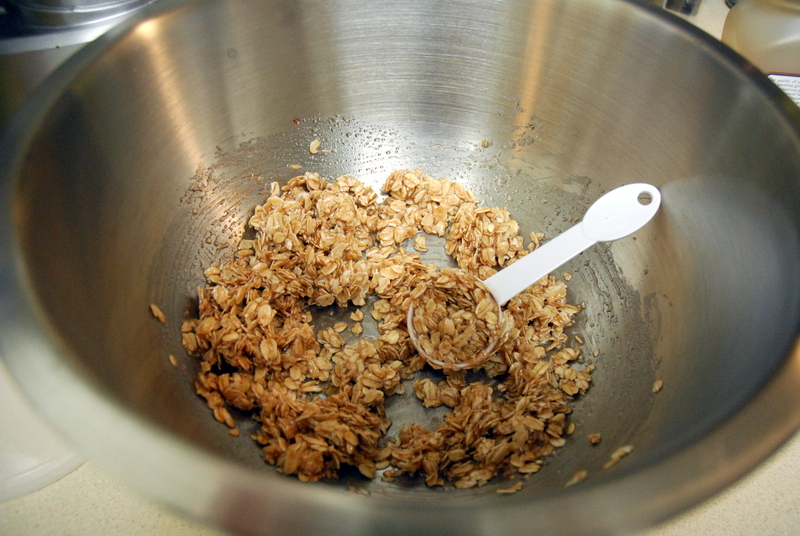 If you want a more crispy granola, I would suggest baking it a little longer and adding a little less jam. It is so simple to make. 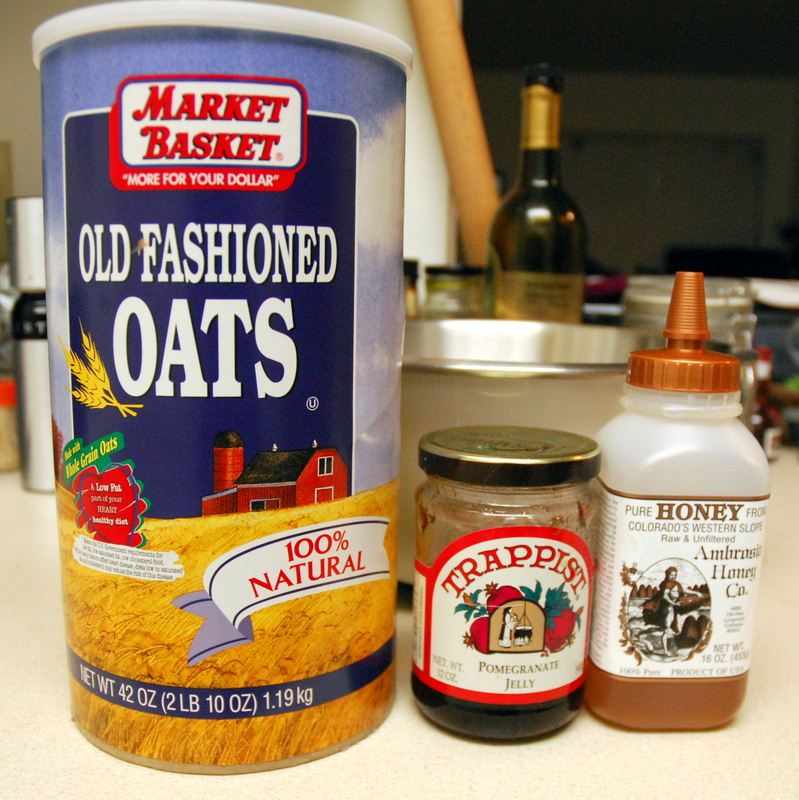 I added flax seed to boost the nutritional value, but it only has four basic ingredients: old fashioned oats, jelly, honey and canola oil. Anyone can make it! Mix together jelly, honey, and oil. 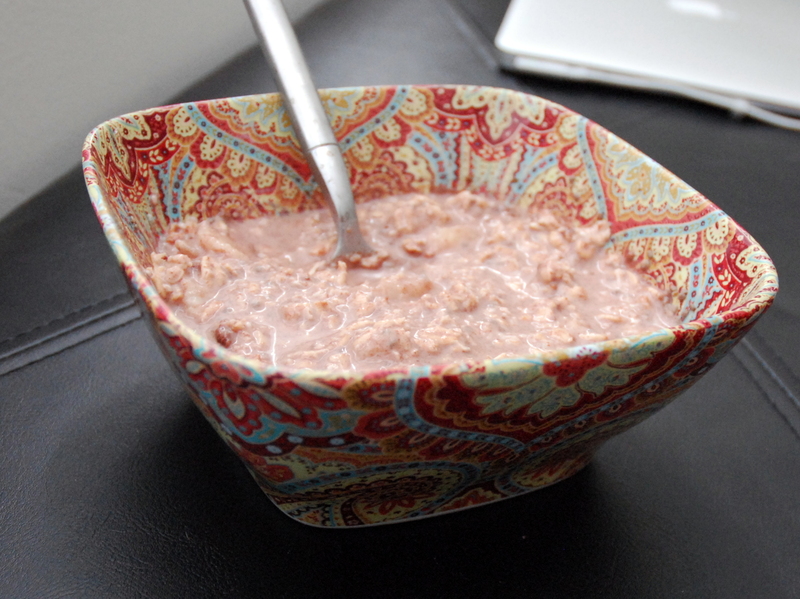 Mix in your oats until well coated. Put the oats on an oiled cookie sheet and bake at 325 for 30 minutes, flipping halfway through (and adding flax seed if desired). Let it cool for an hour and enjoy! *I only made half this recipe because we were almost out of oats! The recipe below is my normal yielding. 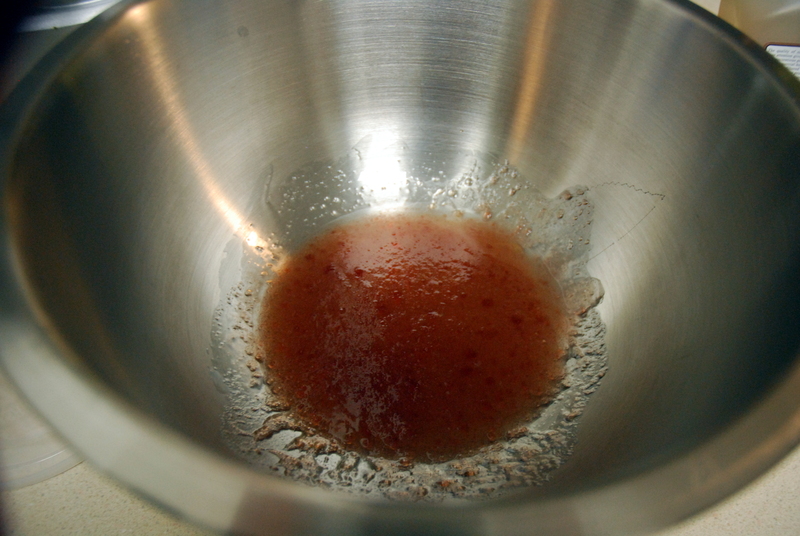 2) Mix together honey, jelly, and canola oil in a mixing bowl until combined. 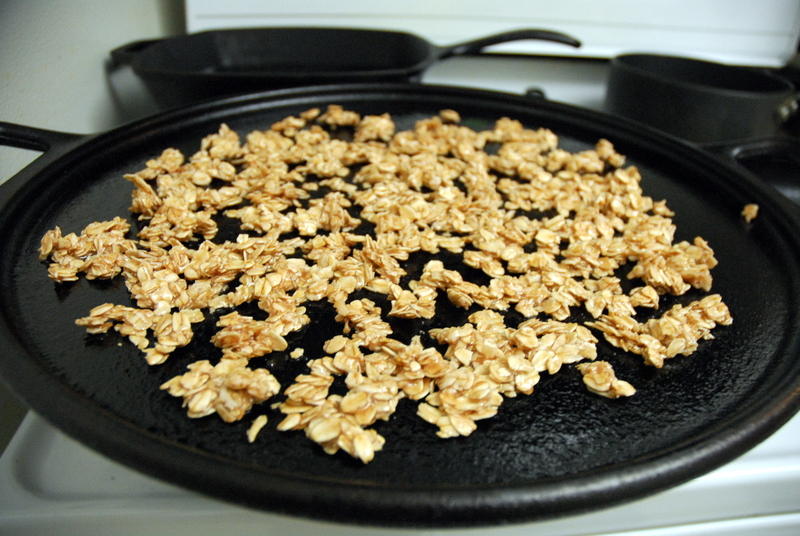 3) Add oats and mix until the oats are well coated. 4) Spread the mixture out onto a greased cookie sheet (or pizza pan in my case!). 5) Bake for 15 minutes. 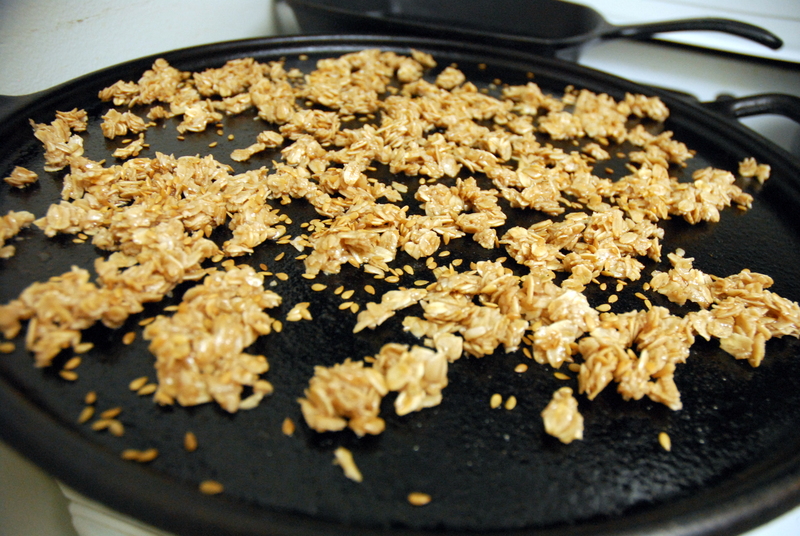 6) Flip the granola and sprinkle on the flax seed (if using). Then bake for another 15 minutes (30 minutes total). 7) Let cool for an hour and enjoy! This entry was posted in Breakfast, Recipes, Snacks, Teddy and tagged granola, pomegranate, Snacks, sushi, teddy. Bookmark the permalink. If I remember correctly, I was bribed by my boyfriend :). I forget what the prize was – probably a bottle of wine! Your doggie is just adorable!! I love his bandana. Where did you go for sushi? I am also living in the Manchester area and I am constantly looking for a new place to go for sushi. Right now I go to Taipei & Tokyo but I want to go somewhere new. I like Taipei & Tokyo too – though I tend to get Chinese there more often. 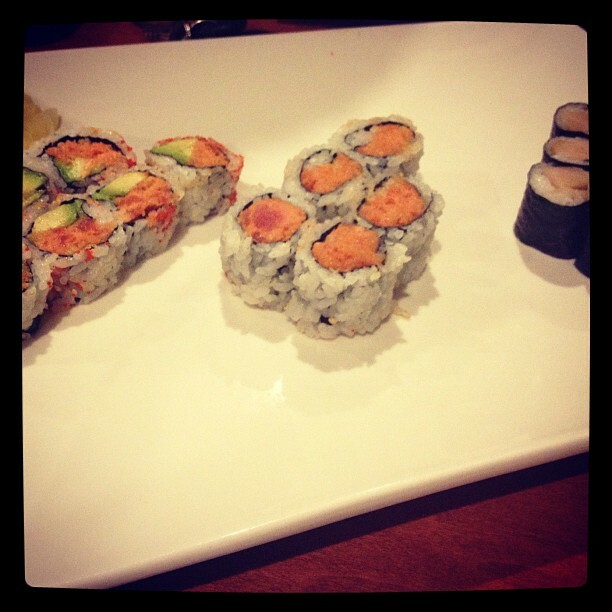 We went to Ichiban in Concord the other night – it was really good. Though I’m not the best sushi judge because I really only eat spicy tuna rolls :). My boyfriend and his brother like Ichiban too and they are more into sushi. I’ve also gone to Aloe Garden in Goffstown for their Sunday night sushi specials and they were good too (especially for the price!). Thanks for stopping by the blog!